Syracuse, N.Y. – The Great New York State Fair visitor who submits the best name for the dory built at the Fair last year will win it. Those who submit Name-That-Boat entries at the new "Path Through Maritime History: NY Lighthouses and Lifesaving" exhibit will also have the opportunity to win a daily prize of a family pass to the H. Lee White Maritime Museum at Oswego, NY. The Fair runs from August 22 through Labor Day September 3, 2018. Fair-goers will find contest rules and can submit entries at the Lighthouses exhibit developed by New York Sea Grant and sponsored by the Central New York Boating Industries Association, Central New York Boat Show, Great Lakes Seaway Trail National Scenic Byway, and Great New York State Fair. A dory is a small, shallow-draft boat with a flat bottom. A 9-foot-long dory was built by Richard Bush at the NY Maritime Heritage Exhibit and launched on Labor Day at the 2017 Great New York State Fair. At this year&apos;s Fair, Bush will construct a 12-foot-long strip-built kayak and talk about his techniques with visitors daily 11 am-12 pm, 1-2 pm, and 3-4 pm at the Lighthouses and Lifesaving exhibit. Bush has been teaching basic boat building to families at the H. Lee White Maritime Museum for the past 13 summers. His first experience with building a boat at the State Fair was last year. He built the dory and a stitch-and-glue kayak. "Some Fair visitors came back several days to watch the process. 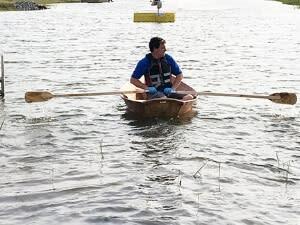 They were intrigued by the techniques used and that someone could actually use their hands and in less than 15 hours have a useable boat," says Bush, an Associate Professor in the Department of Technology at the State University of New York at Oswego. The winner of the Name That Boat contest will be selected from the 12 daily winners and announced at 10:30 am on Labor Day when the kayak built this year is launched into the State Fair pond. In addition to the boat building demonstrations and dory naming contest, the "Path Through Maritime History: Lighthouses and Lifesaving" exhibit includes an interactive kiosk with information on the more than 70 existing lighthouses in New York, female lighthouse keepers, and the technology of lighthouses; and maritime artifacts associated with the lighthouse and lifesaving service. Activities at the exhibit include a real-time fish-cam broadcast and the daily 2-4 pm opportunity for Fair visitors to try operating an underwater remotely-operated vehicle used by the Great Lakes Research Consortium for freshwater coastal research. For ticket information, map, and more details about the 2018 Great New York State Fair, visit nysfair.ny.gov. For more details on New York Sea Grant&apos;s maritime history programming, visit www.nyseagrant.org/davewhite. New York Sea Grant is a cooperative program of Cornell University and the State University of New York, and one of 33 university-based programs under the National Sea Grant College Program of the National Oceanic and Atmospheric Adminstration. For updates on New York Sea Grant activities statewide, www.nyseagrant.org has RSS, Facebook, Twitter, and YouTube links. New York Sea Grant has Great Lakes offices in Buffalo, Newark, and Oswego, NY. H. Lee White Maritime Museum of Oswego, NY, is in the heart of the historic Oswego Maritime District and overlooks Lake Ontario. The Museum is spearheading the restoration of the historic Oswego West Pierhead Lighthouse and offers lighthouse tours. The Museum collections include numerous artifacts illustrating life on the water and along the shore. At dockside, the Museum is home to the National Historic Landmark LT5 World War II tugboat, the 1927 New York State Canal System Derrick Boat 8, and the Eleanor D, a commercial fishing vessel built in 1948. The Museum archive feature thousands of historic photographs, documents, publications, ship plans, and maps. The Museum hosts an annual boat building class for families. Learn more: www.hlwmm.org.